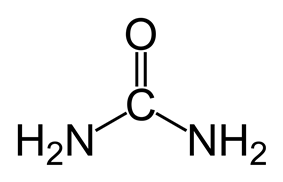 Urea or carbamide is an chemical formula CO(NH2)2. The molecule has two —NH2 groups joined by a carbonyl (C=O) functional group. Urea serves an important role in the metabolism of nitrogen-containing compounds by animals and is the main nitrogen-containing substance in the urine of mammals. It is a colorless, odorless solid, highly soluble in water and practically non-toxic (LD50 is 15 g/kg for rat). Dissolved in water, it is neither acidic nor alkaline. The body uses it in many processes, the most notable one being nitrogen excretion. 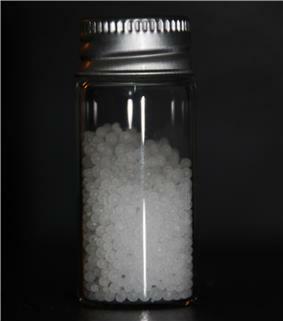 Urea is widely used in fertilizers as a convenient source of nitrogen. Urea is also an important raw material for the chemical industry. The terms urea is also used for a class of carbamide peroxide, allantoin, and hydantoin. Ureas are closely related to biurets and related in structure to amides, carbamates, carbodiimides, and thiocarbamides. Urea was first discovered in urine in 1727 by the Dutch scientist Herman Boerhaave, though this discovery is often attributed to the French chemist Hilaire Rouelle. This was the first time an organic compound was artificially synthesized from inorganic starting materials, without the involvement of living organisms. The results of this experiment implicitly discredited Berzelius: "I must tell you that I can make urea without the use of kidneys, either man or dog. 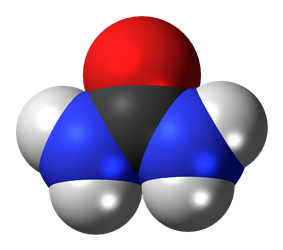 Ammonium cyanate is urea. "[note 1] For this discovery, Wöhler is considered by many the father of organic chemistry. Amino acids from ingested food that are not used for the synthesis of proteins and other biological substances are oxidized by the body, yielding urea and carbon dioxide, as an alternative source of energy. The oxidation pathway starts with the removal of the amino group by a transaminase; the amino group is then fed into the urea cycle. Ammonia (NH3) is another common byproduct of the metabolism of nitrogenous compounds. Ammonia is smaller, more volatile and more mobile than urea. If allowed to accumulate, ammonia would raise the pH in cells to toxic levels. Therefore many organisms convert ammonia to urea, even though this synthesis has a net energy cost. Being practically neutral and highly soluble in water, urea is a safe vehicle for the body to transport and excrete excess nitrogen. The cycling of and excretion of urea by the kidneys is a vital part of mammalian metabolism. Besides its role as carrier of waste nitrogen, urea also plays a role in the countercurrent exchange system of the nephrons, that allows for re-absorption of water and critical ions from the excreted urine. Urea is reabsorbed in the inner medullary collecting ducts of the nephrons, thus raising the osmolarity in the medullary interstitium surrounding the thin ascending limb of the loop of Henle, which in turn causes water to be reabsorbed. By action of the urea transporter 2, some of this reabsorbed urea will eventually flow back into the thin ascending limb of the tubule, through the collecting ducts, and into the excreted urine. This mechanism, which is controlled by the antidiuretic hormone, allows the body to create hyperosmotic urine, that has a higher concentration of dissolved substances than the blood plasma. This mechanism is important to prevent the loss of water, to maintain blood pressure, and to maintain a suitable concentration of sodium ions in the blood plasma. For use in industry, urea is produced from synthetic ammonia and carbon dioxide. As large quantities of carbon dioxide are produced during the ammonia manufacturing process as a byproduct from hydrocarbons (predominantly natural gas, less often petroleum derivatives), or occasionally from coal, urea production plants are almost always located adjacent to the site where the ammonia is manufactured. Although natural gas is both the most economical and the most widely available ammonia plant feedstock, plants using it do not produce quite as much carbon dioxide from the process as is needed to convert their entire ammonia output into urea. In recent years new technologies such as the KM-CDR process have been developed to recover supplementary carbon dioxide from the combustion exhaust gases produced in the fired reforming furnace of the ammonia synthesis gas plant, allowing operators of stand-alone nitrogen fertilizer complexes to avoid the need to handle and market ammonia as a separate product and also to reduce their 'greenhouse gas' emissions to the atmosphere. The overall conversion of NH3 and CO2 to urea is exothermic, the reaction heat from the first reaction driving the second. Like all chemical equilibria, these reactions behave according to Le Chatelier's principle, and the conditions that most favour carbamate formation have an unfavourable effect on the urea conversion equilibrium. The process conditions are, therefore, a compromise: the ill-effect on the first reaction of the high temperature (around 190̂̂°C) needed for the second is compensated for by conducting the process under high pressure (140–175 bar), which favours the first reaction. Although it is necessary to compress gaseous carbon dioxide to this pressure, the ammonia is available from the ammonia plant in liquid form, which can be pumped into the system much more economically. To allow the slow urea formation reaction time to reach equilibrium a large reaction space is needed, so the synthesis reactor in a large urea plant tends to be a massive pressure vessel. Because the urea conversion is incomplete, the product has to be separated from unchanged ammonium carbamate. In early "straight-through" urea plants this was done by letting down the system pressure to atmospheric so as to allow the carbamate to decompose back to ammonia and carbon dioxide. Originally, because it was not economic to recompress the ammonia and carbon dioxide for recycle, the ammonia at least would be used for the manufacture of other products, for example ammonium nitrate or sulfate. (The carbon dioxide would be wasted, as likely as not.) Later process schemes were developed to allow recycling of the unused ammonia and carbon dioxide. This was accomplished by depressurizing the reaction solution in stages (first to 18–25 bar and then to 2–5 bar) and passing it at each stage through a steam-heated "carbamate decomposer", then recombining the resultant carbon dioxide and ammonia in a falling-film "carbamate condenser" and pumping the carbamate solution into the previous stage. There are two main disadvantages to the "total recycle" concept just outlined. The first is the complexity of the flow scheme and, consequently, the amount of process equipment needed; the second is the amount of water recycled in the carbamate solution, which has an adverse effect on the equilibrium in the urea conversion reaction and thus on the overall efficiency of the plant. The stripping concept, developed in the early 1960s by Stamicarbon in The Netherlands, addressed both problems. It also improved heat recovery and reuse in the process. The position of the equilibrium in the carbamate formation/decomposition depends on the product of the partial pressures of the reactants. In the total recycle processes carbamate decomposition is promoted by reducing the overall pressure, which reduces the partial pressure of both ammonia and carbon dioxide. But it is possible to achieve a similar effect without lowering the overall pressure by suppressing the partial pressure of just one of the reactants. Instead of being fed directly to the reactor along with the ammonia, as in the total recycle process, in the stripping process the carbon dioxide gas is first routed through a stripper (a carbamate decomposer operating under the full system pressure which is configured to provide maximum gas-liquid contact), flushing out free ammonia and thus reducing its partial pressure over the liquid surface, and carrying it directly to a carbamate condenser (also operating at full system pressure), from which reconstituted ammonium carbamate liquor passes directly to the reactor. That allows the medium-pressure stage of the total recycle process to be omitted altogether. The stripping concept proved to be such a major advance that competitors such as Snamprogetti – now Saipem – (Italy), the former Montedison (Italy), Toyo Engineering Corporation (Japan) and Urea Casale (Switzerland) all developed their own versions of it. Today effectively all new urea plants use the principle, and many total recycle urea plants have been converted to stripping processes. No radical alternative to it has been proposed; the main thrust of technological development today, in response to industry demands for ever larger individual plants, is directed at reconfiguring and reorientating major items in the plant to reduce their size and the overall height of the plant, as well as at meeting ever more challenging environmental performance targets. It is fortunate that the urea conversion reaction is a slow one, because if it were not it would go into reverse in the stripper. As it is, the succeeding stages of the process must be designed to minimize residence times, at least until the temperature has been reduced to the point where the reversion reaction is very slow. This reaction is at its worst when the urea solution is heated at low pressure, which happens when the solution is concentrated for prilling or granulation (see below). The reaction products mostly volatilize into the overhead vapours and recombine when these are condensed to form urea again, which contaminates the process condensate. Ammonium carbamate solutions are notoriously corrosive towards metallic materials of construction, even the more resistant forms of stainless steel, especially in the hottest parts of the plant such as the stripper. Traditionally corrosion has been minimized (although not eliminated) by continuously injecting a minor amount of oxygen (as air) into the plant to establish and maintain a passive oxide layer on exposed stainless steel surfaces. But because the carbon dioxide feed is recovered from ammonia synthesis gas it contains traces of hydrogen which can mingle with the passivation air to form an explosive mixture if allowed to accumulate in the plant. In the mid 1990s two duplex (ferritic-austenitic) stainless steels were introduced (DP28W, jointly developed by Toyo Engineering and Sumitomo Metals Industries  and Safurex, jointly developed by Stamicarbon and Sandvik Materials Technology (Sweden) ) which have allowed the amount of passivation oxygen to be drastically reduced and can, in theory, operate without oxygen at all. Saipem now uses either zirconium stripper tubes or bimetallic tubes comprising a titanium body (which is cheaper but less erosion-resistant) to which is metallurgically bonded an internal lining of zirconium. These tubes are fabricated by ATI Wah Chang (USA), a leading specialist in refractory and 'reactive' metals, using its Omegabond technique. For its main use as a fertilizer urea is mostly marketed in solid form, either as prills or granules. The advantage of prills is that, in general, they can be produced more cheaply than granules and that the technique was firmly established in industrial practice long before a satisfactory urea granulation process was commercialized. However, on account of the limited size of particles that can be produced with the desired degree of sphericity and their low crushing and impact strength, the performance of prills during bulk storage, handling and use is generally (although not always!) considered inferior to that of granules. Surprisingly, perhaps, considering the product particles are anything but spherical, pastillation using a Rotoform steel-belt pastillator is beginning to gain ground as a urea particle-forming process as a result of development work by Stamicarbon in collaboration with Sandvik Process Systems (Germany). Single-machine capacity is limited to 175 t/d, but the machines are simple and need little maintenance, specific power consumption is much lower than for granulation, and the product is very uniform. The robustness of the product appears to make up for its very non-spherical shape. 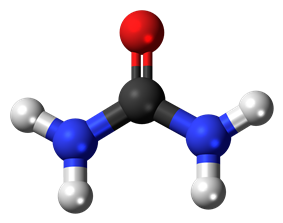 Urea was first noticed by Hermann Boerhaave in the early 18th century from evaporates of urine. In 1773, Hilaire Rouelle obtained crystals containing urea from human urine by evaporating it and treating it with alcohol in successive filtrations. This method was aided by Carl Wilhelm Scheele's discovery that urine treated by concentrated nitric acid precipitated crystals. Antoine François, comte de Fourcroy and Louis Nicolas Vauquelin discovered in 1799 that the nitrated crystals were identical to Rouelle's substance and invented the term "urea." Berzelius made further improvements to its purification and finally William Prout, in 1817, succeeded in obtaining and determining the chemical composition of the pure substance. In the evolved procedure, urea was precipitated as urea nitrate by adding strong nitric acid to urine. To purify the resulting crystals, they were dissolved in boiling water with charcoal and filtered. After cooling, pure crystals of urea nitrate form. To reconstitute the urea from the nitrate, the crystals are dissolved in warm water, and barium carbonate added. The water is then evaporated and anhydrous alcohol added to extract the urea. This solution is drained off and allowed to evaporate resulting in pure urea. By virtue of its tendency to form a porous frameworks, urea has the ability to trap many organic compounds. In these so-called hydrogen-bonded urea molecules. This behaviour can be used to separate mixtures, e.g. in the production of aviation fuel and lubricating oils, and in the separation of hydrocarbons. Many soil bacteria possess the enzyme urease, which catalyzes the conversion of the urea to ammonia or ammonium ion and bicarbonate ion, thus urea fertilizers are very rapidly transformed to the ammonium form in soils. Among soil bacteria known to carry urease, some ammonia-oxidizing bacteria (AOB), such as species of Nitrosomonas, are also able to assimilate the carbon dioxide released by the reaction to make biomass via the Calvin Cycle, and harvest energy by oxidizing ammonia (the other product of urease) to nitrite, a process termed nitrification. Nitrite-oxidizing bacteria, especially Nitrobacter, oxidize nitrite to nitrate, which is extremely mobile in soils because of its negative charge and is a major cause of water pollution from agriculture. Ammonium and nitrate are readily absorbed by plants, and are the dominant sources of nitrogen for plant growth. Urea is also used in many multi-component solid fertilizer formulations. Urea is highly soluble in water and is, therefore, also very suitable for use in fertilizer solutions (in combination with ammonium nitrate: UAN), e.g., in 'foliar feed' fertilizers. For fertilizer use, granules are preferred over prills because of their narrower particle size distribution, which is an advantage for mechanical application. Urea is usually spread at rates of between 40 and 300 kg/ha but rates vary. Smaller applications incur lower losses due to leaching. During summer, urea is often spread just before or during rain to minimize losses from volatilization (process wherein nitrogen is lost to the atmosphere as ammonia gas). Urea is not compatible with other fertilizers. In irrigated crops, urea can be applied dry to the soil, or dissolved and applied through the irrigation water. Urea will dissolve in its own weight in water, but it becomes increasingly difficult to dissolve as the concentration increases. Dissolving urea in water is endothermic, causing the temperature of the solution to fall when urea dissolves. In foliar sprays, urea concentrations of 0.5% – 2.0% are often used in horticultural crops. Low-biuret grades of urea are often indicated. Urea absorbs moisture from the atmosphere and therefore is typically stored either in closed/sealed bags on pallets or, if stored in bulk, under cover with a tarpaulin. As with most solid fertilizers, storage in a cool, dry, well-ventilated area is recommended. Urea can in principle serve as a hydrogen source for subsequent power generation in fuel cells. Urea present in urine/wastewater can be used directly (though bacteria normally quickly degrade urea.) Producing hydrogen by electrolysis of urea solution occurs at a lower voltage (0.37V) and thus consumes less energy than the electrolysis of water (1.2V). Urea in concentrations up to 8 M can be used to make fixed brain tissue transparent to visible light while still preserving fluorescent signals from labeled cells. This allows for much deeper imaging of neuronal processes then previously obtainable using conventional one photon or two photon confocal microscopes. Certain types of instant cold packs (or ice packs) contain water and separated urea crystals. Rupturing the internal water bag starts an endothermic reaction and allows the pack to be used to reduce swelling. ^ "Solubility of Various Compounds in Glycerine". ^ Williams, R. (2001-10-24). "pKa Data". Retrieved 2009-11-27. Herman Boerhaave, Elementa Chemicae … , volume 2, (Leipzig ("Lipsiae"), (Germany): Caspar Fritsch, 1732), page 276. Gerrit A. Lindeboom, Boerhaave and Great Britain … , (Leiden, Netherlands: E.J. Brill, 1974), page 51. H. J. Backer (1943) "Boerhaave's Ontdekking van het Ureum" (Boerhaave's discovery of urea), Nederlands Tijdschrift voor Geneeskunde (Dutch Journal of Medicine), 87 : 1274–1278 (in Dutch). ^ Kurzer, Frederick; Sanderson, Phyllis M. (1956). "Urea in the History of Organic Chemistry". Journal of Chemical Education (American Chemical Society) 33 (9): 452–459. ^ Gibb, Bruce C. (2009). "Teetering towards chaos and complexity". Nature Chemistry (Nature Publishing Group) 1 (1): 17–18. ^ Sakami W, Harrington H (1963). "Amino acid metabolism". Annual Review of Biochemistry 32 (1): 355–98. ^ Section 1.9.2 (page 76) in: Jacki Bishop; Thomas, Briony (2007). Manual of Dietetic Practice. Wiley-Blackwell. ^ Kishimoto, S.; Shimura, R.; Kamijo, T. (2008). MHI Proprietary Process for Reducing CO2 Emission and Increasing Urea Production". Nitrogen + Syngas 2008 International Conference and Exhibition, Moscow. ^ Meessen, J. H. (2010). "Ullmann's Encyclopedia of Industrial Chemistry". ^ James, G>R; Oomen, C.J. : "An Update on the Biuret Myth". Nitrogen 2001 International Conference, Tampa. ^ Yamadera, Y.; Nagashima, N. (to Sumitomo Metal Industries Ltd and Toyo Engineering Corporation): "Duplex Stainless Steel for Urea Manufacturing Plants". US 2003/0155046 (2003); US 7,347,903 (2008). ^ Eijkenboom, J.; Wijk, J. (2008): "The Behaviour of Safurex". Nitrogen+Syngas 295, 45–51. ^ Bruynseels, J.P. (1981): "NSM's Fluidized-Bed Urea Granulation Process". Fertilizer Nitrogen International Conference, London. Proceedings, pp. 277–288. ^ "Fair Wind for FB Tecnology". Nitrogen+Syngas 282, 40–47. ^ van der Werf, J.W. ; Brouwer, M.J. (to DSM IP Assets BV) (2010): "Process for the production of ure-comprising particles". US 7,700,012. ^ Baeder, Albert. "Rotoform Urea Particles – The Sustainable Premium Product". UreaKnowHow.com. Retrieved 21 January 2014. ^ "Is UAN the Solution?" Nitrogen+Syngas 287, 28–30 (2007). ^ Welch, I. (2007): "Urea vs UAN". Nitrogen+Syngas 289, 26–27. ^ Rouelle (1773) "Observations sur l'urine humaine, & sur celle de vache & de cheval, comparées ensemble" (Observations on human urine and on that of the cow and horse, compared to each other), Journal de Médecine, de Chirurgie et de Pharmacie, 40 : 451–468. Rouelle describes the procedure by which he separated urea from urine on pages 454–455. ^ "Four Centuries of Clinical Chemistry,", 1999: 41. ^ Godfrey, Peter; Brown, Ronald and Hunter, Andrew (1997). "The shape of urea". Journal of Molecular Structure. 413–414: 405–414. ^ www.dooyoo.co.uk (2009-06-19). """Lacura Multi Intensive Serum – Review – Excellent value for money – Lacura Multi Intensive Serum "Aqua complete. Dooyoo.co.uk. Retrieved 2010-12-28. ^ Crawford, J. Hamilton; McIntosh, J. F. (1925). "The use of urea as a diuretic in advanced heart failure". ^ Decaux, Guy; Andres, Caroline; Kengne, Fabrice Gankam; Soupart, Alain (14 October 2010). "Treatment of euvolemic hyponatremia in the intensive care unit by urea". Critical Care 14 (R184). ^ Traynor, Jamie; Mactier R; Geddes CC; Fox JG (October 2006). "How to measure renal function in clinical practice". British Medical Journal 333 (7571): 733–737. ^ Baumgartner, M., M. Flöck, P. Winter, W. Lu, and W. Baumgartner. 2005. Evaluation of flow injection analysis for determination of urea in sheep's and cow's milk. Acta Veterinaria Hungarica. 50 (3): 263–271. ^ Greenan, N. S., R.L. Mulvaney, and G.K. Sims. 1995. A microscale method for colorimetric determination of urea in soil extracts. Communications in Soil Science and Plant Analysis. 26:2519–2529. ^ J. Shorter (1978). "The conversion of ammonium cyanate into urea—a saga in reaction mechanisms".